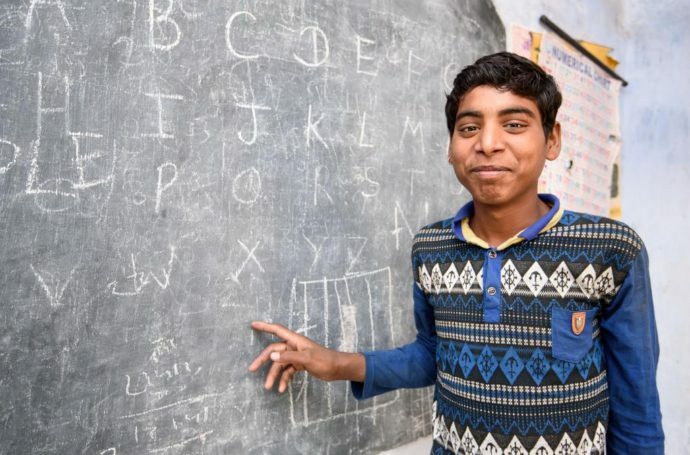 Sanjay stands out in his classroom: not just because he is one of the tallest children, but also because he is very motivated. Not so long ago, his life was completely different: Sanjay worked in the stone quarry from when he was 9 years old until he was 12. He made cobblestones for the European market. Until his employer decided, one year ago, that it was enough. “He told me that I could no longer work for him. We went to school together and he enrolled me,” says Sanjay. Ever since 2013, the local NGO Majari has been working to convince the entire community that children should be at school and not at work. “It is really great that even employers are taking their responsibility now,” says Bajrang, a very proactive member of Manjari. Sanjay is doing his very best to catch up at school with all the years he missed out on. What would he like to be when he grows up? “A teacher!” he beams.